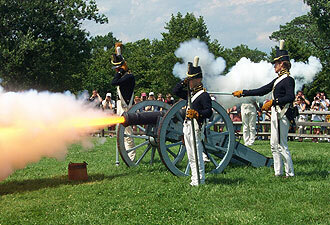 Dressed in War of 1812 uniforms, members of the Fort McHenry Guard fire the fort's field cannon during the “Fort, Flag, and Fire!” demonstration every summer. 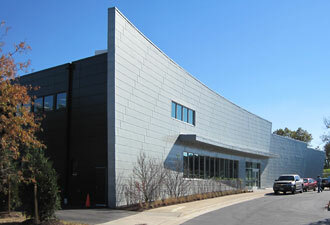 Like broad stripes, the zinc facade of the new visitor and education center gleams in the morning light. The building is on target for a silver rating in LEED certification. With spring around the corner, you're probably thinking about outdoor activities. 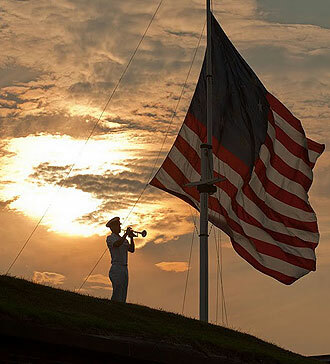 Many of us finally shake winter cabin fever through the American pastime of baseball—a game that begins with the stirring words of “The Star-Spangled Banner.” The national anthem and the “star-spangled” American flag both have power to stir patriotism, and both are present at Fort McHenry National Monument and Historic Shrine. It's the only monument AND historic shrine in the national park system, and most agree that it lives up to the expectations set by such a long title. Today a visit enables you to feel the rush of emotion that prompted Key to write. Make sure to stop in at the park's new visitor and education center. A new movie offers fast action, explosions, pulsating music, and the American flag. Imagine Master and Commander set in America at warp speed, and you'll get the idea. Interactive exhibits enable you to listen to the national anthem sung by a range of artists, such as the U.S. Marine Corps Band and Jimi Hendrix, and to see how fast Key's words spread through the United States, even before cell phones and the internet. The fort still guards the harbor, and a short walk takes you to the ramparts (that's fort speak for the top of the wall) to see the location of Key's ship. On summer weekends, the Fort McHenry Guard, a trained group of staff and volunteers who love blowing things up, is on duty. Dressed in the resplendent uniforms of the early 19th century, they perform musket and cannon-firing demonstrations and serenade visitors with stirring fife and drum music. But an encounter with the Guard isn't all guns and testosterone. Civilian members of the group portray merchants, washerwomen, soldier's wives, and flag-makers. Regularly scheduled ranger walks provide fun facts about the fort and children's activities. Note: the park's Junior Ranger program is awesome. If you only have time for one thing, attend the flag talk. All year, every morning and evening and several times during the day, a replica 1814 flag is hoisted and lowered over the fort. Visitors can experience history hands-on by helping to raise, hold, or fold the mammoth flag. It's almost like being allowed to ring the Liberty Bell or hold the Declaration of Independence. You can even bring your own American flag and run it up the flagpole. Check out the park's website for upcoming special events. Note that the annual anniversary of the battle offers a ship-to-shore bombardment and Maryland's Governor O'Malley in full 1812 regalia. Come see what the British missed (since they couldn't visit the fort) and afterward, treat yourself to some famous Baltimore crab cakes.